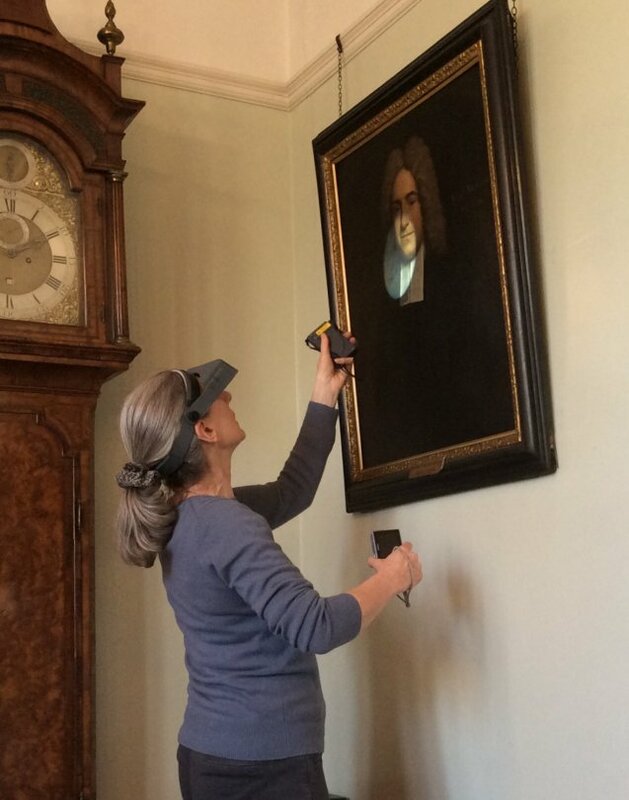 Recent initiatives have included employing a paintings conservator to carry out a condition survey of the Library's paintings. The Portrait Project was already underway with the initial work of drawing together information about the works of art and creating a temporary storage for this collection which offered acceptable conditions. Supported by a skilled volunteer, the library's conservator has been listing and identifying the approximately 300 paintings in our collection. Procedures have been introduced to safeguard the works of art. A room, with an acceptable environment for oil paintings, will be dedicated to the portraits. A rolling unit (given by the Bodleian Library) has been assembled. The conservator is also working with a team of specialist photograpers who are photographing the collection. Ruth Bubb examining one of the Dr Williams's Library portraits.